Peripherin/RDS, a photoreceptor-specific glycoprotein, located in the peripheral portion of the disc membranes of photoreceptor outer segments of both rods and cones (1–4). Although the precise function of this protein is still uncertain, it has been postulated that peripherm/RDS plays an important role in maintaining the unique structure of the disc membrane. 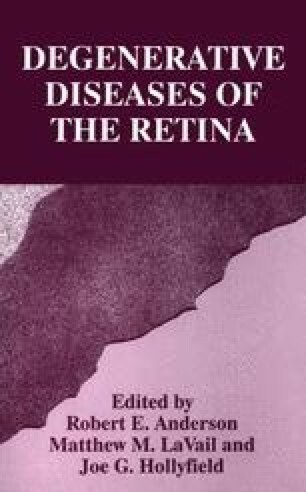 Since a mutation in the peripherin/RDS gene was found to be responsible for retinal degeneration in the rds (retinal degeneration slow) mouse strain (3,4), mutations in the human peripherin/RDS gene have been identified in patients with autosomal dominant retinitis pigmentosa (adRP) (5–10). In addition to typical retinitis pigmentosa, increased numbers of mutations have been identified in the peripherin/RDS gene in families with several kinds of macular dystrophy (8,11), retinitis punctata albescens (12), butterfly-shaped pigment dystrophy of the fovea (13), and fundus flavimaculatus (14). Because peripherm/RDS commonly expressed in both rods and cones, mutations in the peripherin/RDS gene produce either rod- or cone-predominant retinal degeneration, depending on the kinds and locations of mutations. These genotype-phenotype correlations provide important clues not only for better understanding the mechanisms of photoreceptor degeneration produced by mutations in the peripherin/RDS gene, but also for proper genetic counseling based on the accumulated findings regarding clinical courses of patients with known mutations.